Jamaica’s dancehall giants Mavado, Alkaline and Jahmiel are reportedly set to release a gritty diss track aimed at Vybz Kartel. 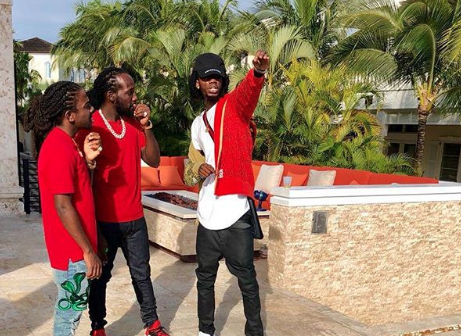 Sources close to the MVP camp (dancehall Most Valuable Players) Mavado, Vendetta (Alkaline) and Patriotz (Jahmiel), says the entertainers recorded a Kartel diss last week and are looking to drop the track anytime soon. News of the diss track comes after Vybz Kartel blasted Alkaline and Mavado along with their Vendetta and Gully fans last week. The incarcerated Dancehall entertainer first took shots at Alkaline when his Instagram account uploaded a video of a Gaza fan. In the clip, a man can be heard asking fans of the “Badness It Name” deejay why were they constantly on Vybz Kartel’s page arguing with his Gaza Nation supporters, “Cause dem & dem #artiste page#boring like when paint a dry…,” Kartel wrote under the video. The “Fever” deejay then slammed a Mavado and a Gully fan after he uploaded a video of Floyd Mayweather Jr. showing off his impressive watch collection. “So wul on deh Vybz Kartel. No same thing ou say bout the Barba Mavado… say him cyaa spell or read?? But him still rich right lol….,” The self-proclaimed “Worl’ Boss” clearly wasn’t here for the comment and wrote, “P****y who name Mavado?,” before going off on the fan.